A complete set of photos from this trip can be found here. 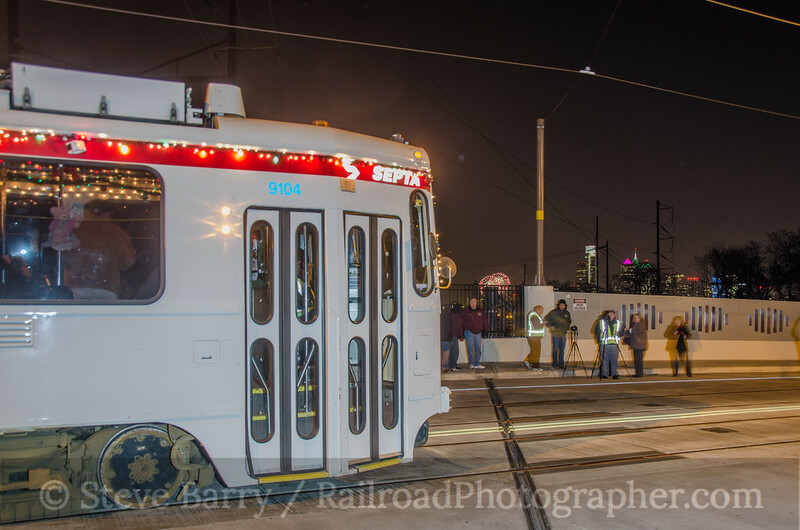 If something you've done twice in a row can be classified as a tradition, then I guess my new tradition is riding the annual New Year's Eve streetcar trip sponsored by the Friends of Philadelphia Trolleys (we did a post on last year's trip as well). The trip started off at the Callowhill Depot, where our Kawasaki car was waiting. 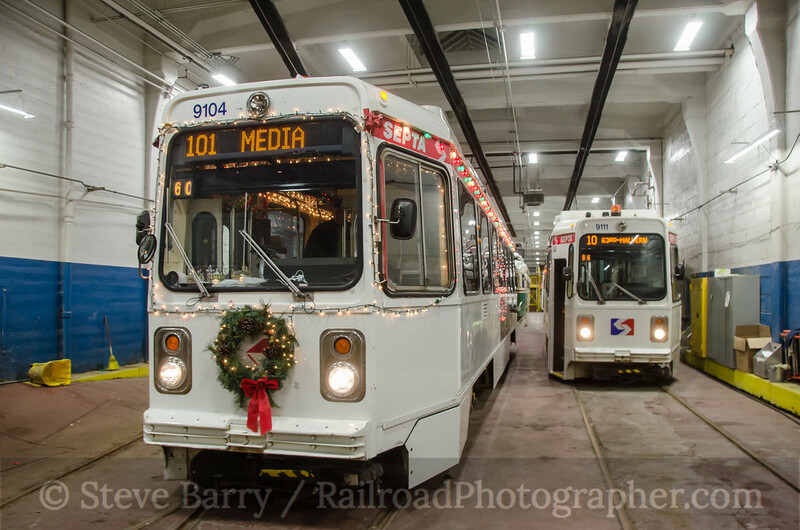 SEPTA operators volunteer their time to decorate some cars for the holidays, and they look pretty sharp. 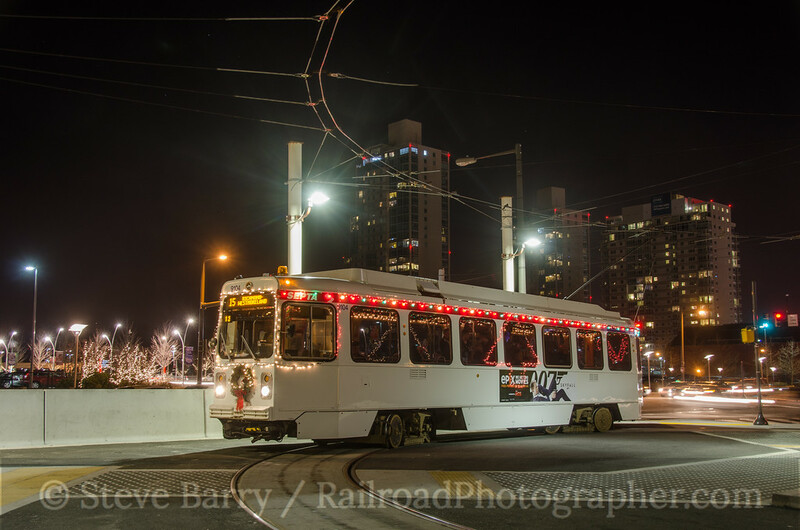 Gary Mason, who was our operator for tonight's charter, decorated car 9104. Just for fun, the car's electronic roll sign had a route displayed that these cars cannot operate on. Once out of Callowhill, we made a passenger pickup at the loop at 63rd & Malvern in West Philadelphia, then headed over the length of Route 15 on Girard Avenue (this route is somewhat truncated right now due to a construction project closing the east end of the line). 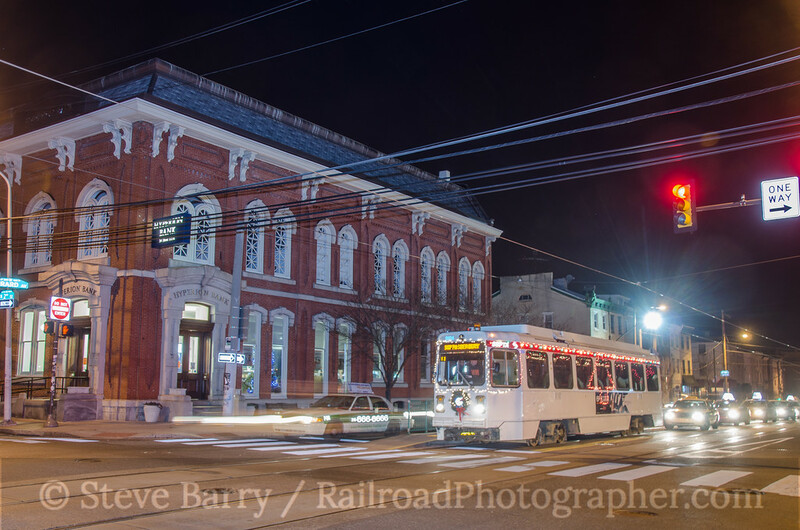 At the terminus of Route 15 at the the Frankford Loop we did a photo stop at the Sugar House Casino. Out of the loop and heading back west on Girard Avenue, we made a photo stop at 2nd & Girard. The heavy volume of taxi traffic on Girard made this shot a little trickier to pull off than we had anticipated. From here it was a matter of finding a spot to pause so passengers could watch the city's fireworks at midnight. Even though the fireworks are launched from near the Sugar House Casino, we found last year that you really couldn't get a shot of the fireworks and the trolley together. 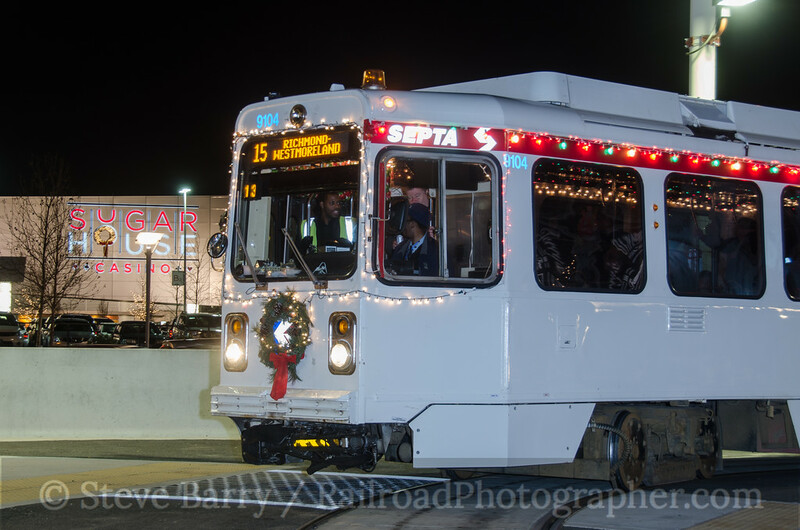 This year it was decided to go to an overpass across SEPTA's regional rail lines at 40th Street; this would give a bit of elevation and it was on non-revenue streetcar trackage so we wouldn't have to worry about regular service cars coming up behind us. The fireworks started promptly at midnight; they were a bit easier to see than the photo would indicate (they are visible between the streetcar and the city skyline). From here we followed SEPTA's Route 13 out of the southwest corner of the city and into the borough of Yeadon. A lengthy photo stop (and restroom stop) was made here, providing a number of different photo angles. Heading back towards the city on SEPTA's Route 11 we left Yeadon and entered Darby (home of a diamond crossing between the Route 11 and CSX's former Baltimore & Ohio main line). 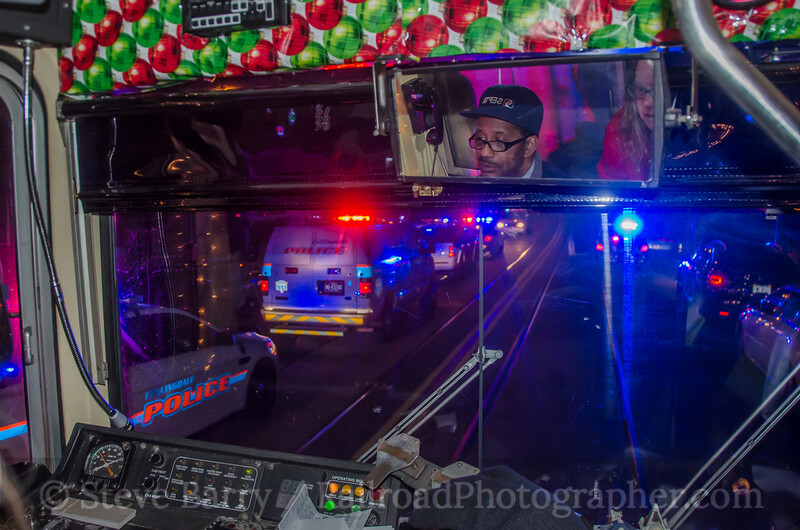 We had seen some police activity throughout the evening at various locations, but just before crossing back into Philadelphia we encountered a bar fight that had attracted police from various boroughs. The volume of police cars blocked our forward progress for several minutes. 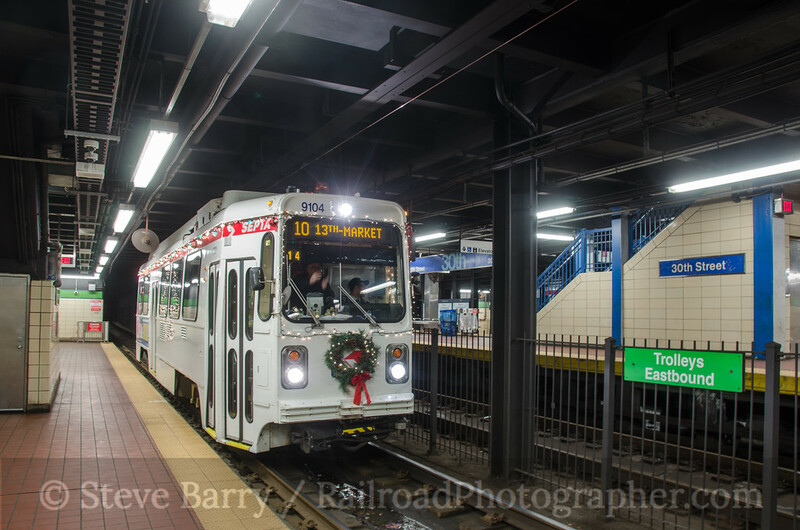 Once the police activity cleared, we made our way into the Center City Tunnel at 40th Street and proceeded under Market Street to 13th Street near City Hall. Along the way a photo stop was made at 30th Street. Now it was time to wrap things up. 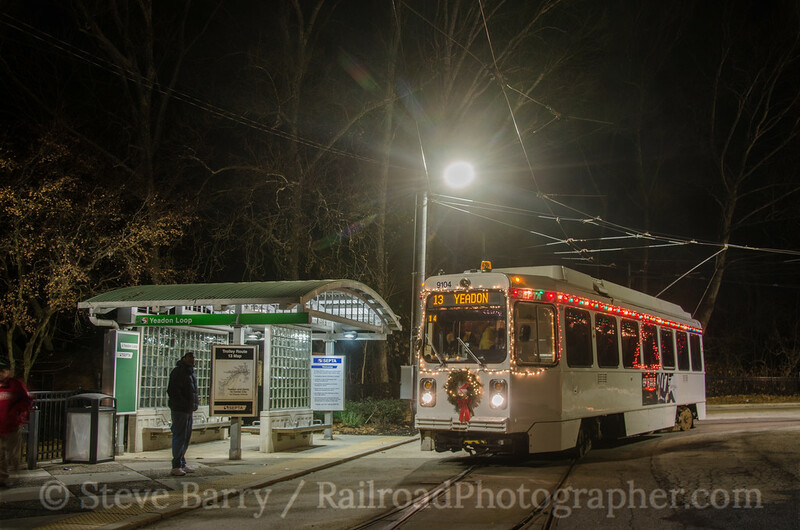 We headed out Route 10 back to Malvern Loop to drop passengers, then proceeded back to Callowhill Depot to bring the trip to an end. 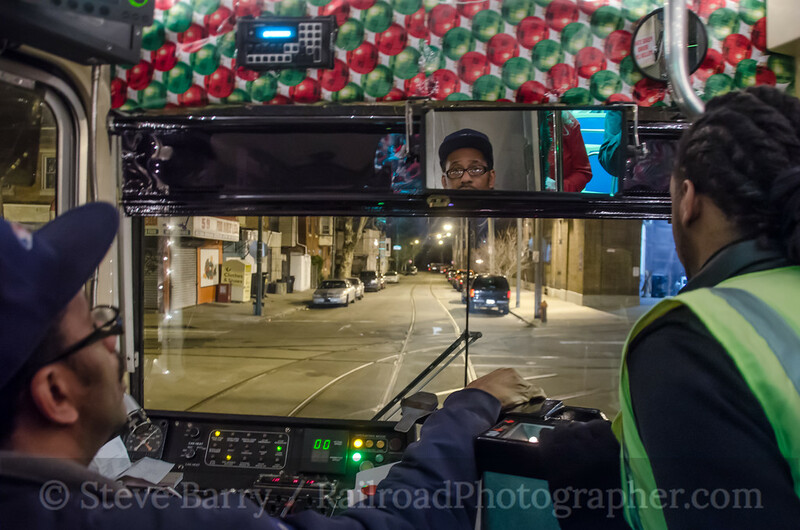 The Friends of Philadelphia Trolleys have been doing these trips for years -- for them it is a tradition. I guess, though, that I can call my two years in a row of riding a tradition as well.